These unique sunglasses represent smart style for women's fashion and are only available for a limited time. This startup has made a line of luxury sustainable sunglasses that mix elements of the land and sea together. They are available now on Kickstarter.com which means they you will be the first to sport the sunglasses and they are the best price now before they hit retail locations and jump to $159 a pair. 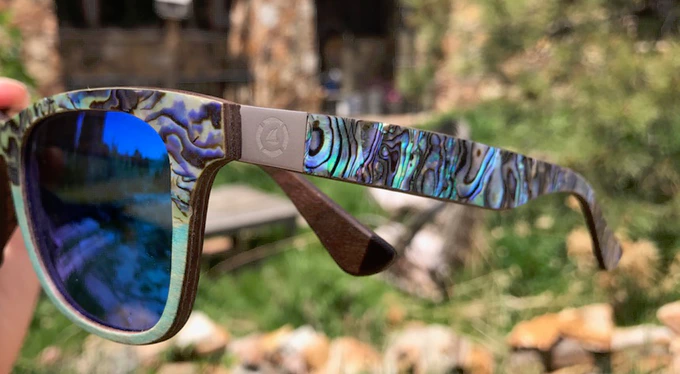 The savvy sunglasses combine elements of wood and beautiful gem quality abalone shells. The combination makes for one of kind glamour and electric style. Sboji, the makers, began in a Midwest town making eco-friendly sunglasses. The See Shells Collection has multiple frame styles and variations to choose from. The Kai: A mix of land and sea in a perfectly balanced way to create an everyday pair of luxurious sunglasses. The Kai comes in four flavors which include two natural wood & two painted wood options with 4 different lens options and choice of laser engraved or recycled aluminum logo. The Avalon: Full frontal shell with blue mirror or classic dark smoke lens options. A classic round wood frame with natural side temples and laser engraved logos feature a nice abalone shell accent on the tips. The Maris: A sleek design fit for festivals, Vegas pool parties, or sunny beach days. They covered their handmade Maris frame in the iridescent sea shells to accomplish this amazing look. Mirror lenses come in yellow or purple. Kickstarter is a great place to shop for new upcoming items that have not even hit the market yet. The platform is based around crowd funding and is always showcasing the most modern and innovative designs in fashion and technology, not to mention your purchases usually go a long way in supporting ethical and artistic companies.